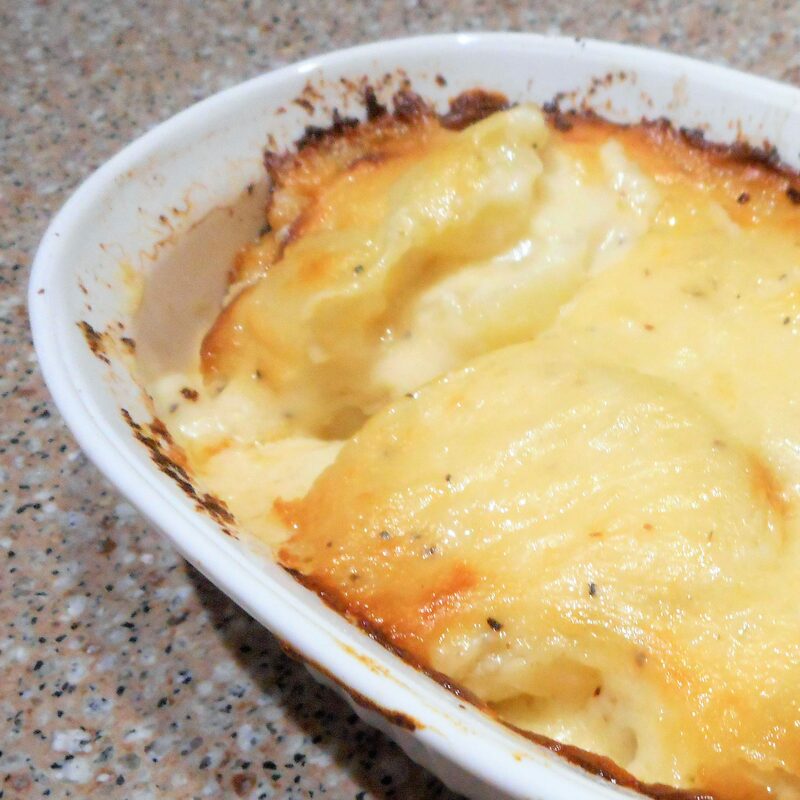 This potato dish is beautifully suited to serving in individual casserole dishes for an impressive presentation. You may use any variety of cheese that suits your fancy, but I think Gruyere is the best! 1. Preheat the oven to 350°. Lightly butter a 1 qt baking dish or two individual ramekins..
2. Fill a large saucepan with cold water. Peel the potatoes, slice them 1/4″ thick, and add to the pan as you go. When all the potatoes have been peeled and sliced, drain off the water and replace with more cold water to cover the potatoes. Add 2 tsp salt and bring to a boil. Boil for 3 minutes, then drain, turn off the heat, and cover to keep warm. 3. Meanwhile, in a medium sauce pan, combine the milk, cream, garlic cloves, salt, pepper, and garlic powder. Over medium low heat, bring the milk mixture to a simmer, stirring occasionally. 4. Pour the milk into the drained potatoes and continue to simmer while you make a roux. 5. Rinse and dry the smaller saucepan. Melt the butter, then whisk in the flour. Cook and stir the roux for 2 or 3 minutes. 6. With a slotted spoon or spider, remove the potatoes to a large bowl and set aside. Retrieve and discard the garlic cloves. Pour the simmering milk into the roux and whisk until smooth. Add the shredded cheese and stir until melted, then pour the sauce over the potatoes and stir gently. Transfer the potatoes into the prepared baking dish. 7. Bake the potatoes, uncovered, for 20 to 30 minutes, or until the top is just beginning to brown. (Individual ramekins may be done a little sooner.) Let stand a few minutes before serving.